One of the highlights of my recent trip to Italy was seeing Michelangeloâ€™s sculpture of David. Words fall short, so Iâ€™ve included this photo. One quality that came through strongly was his focus. He has just slain Goliath, in part as a result of his keen focus. His look is what I call head focus. We all know that the results we get in life have a great deal to do with our ability to bring attention to our chosen goals. Head focus is very concrete, here and now, action oriented. What I call heart focus is equally important. Sometimes we have to go into a place of â€œnot knowing,â€ where our focus is wider, more open to possibilities. So whether youâ€™re at a place of heart or head focus, remember the power they both have. 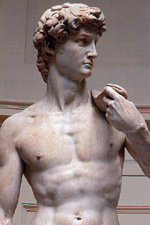 May the beauty of David inspire you to stay focused!